Since posting about the Abandoned Pennsylvania Turnpike, I started to do some digging on why there has been little to no progress on converting the highway into a multi-use trail. Basically, it would be similar to the popular rail trails and greenways throughout the country. We'll begin some background on when the Pennsylvania Turnpike Commission sold 8.5 miles of what was once the Pennsylvania Turnpike to the Southern Alleghenies Conservancy (SAC) for one dollar. The SAC's intentions were to convert the turnpike to a multi-use trail by preserving and adding lighting through the two tunnels (Rays and Sideling Hill), repaving at least 10' of the highway, creating trailheads, and more. Sadly, in the sixteen years that have since passed, not much if anything has been done to either preserve the abandoned roadway or convert it to a multi-use trail. Yet during this same time, numerous newspaper articles and features, websites, and blog entries about the abandoned turnpike has attracted more visitors to explore this old road. However, as each year passes the old road continues to become more overgrown, the roadway and tunnels fall further in disrepair, and graffiti and minor vandalism is seen throughout. So what happened? Why has an idea and a project with great overall interest and visibility have so little done since 2001. Well, it is slightly complicated. But it comes down to a lack of leadership and direction, political concerns over economic impact, and lack of fundraising that has left the old highway no different than it was when the transfer agreement was made. The Southern Alleghenies Conservancy took over the abandoned turnpike in November of 2001. They wisely admitted that their overall goals to preserve and convert the turnpike to a multi-use trail would be an expensive and time consuming undertaking. From 2002 - 2005, the SAC did provide updates on fundraising and overall progress of the project. In 2002, SAC was developing contacts and making their initial plans in seeking funds and applying for grants. Initial grant applications and local business sponsorships were generally unsuccessful. The SAC had begun to identify various safety and improvement concerns, such as tree removals and storm drain clearing. In 2003 and 2004, grant funding and some donations began to funnel into the project. In 2003, the SAC received $35,000 from the USDA Rural Development Grant, and they would later receive $20,000 in form of a matching grant from the Pennsylvania Department of Culture and Natural Resources Heritage Parks Program. They would also be awarded a $70,000 transportation enhancement grant from the Southern Alleghenies Planning and Development Commission. This grant was to help build a trailhead at the Eastern (Fulton County) edge of the trail. Also, during this time the SAC was working with the PA Game Commission and other state agencies to reduce vandalism on the abandoned highway. Much of the fundraising was done to help develop a master plan. The master plan would eventually be developed by Ganett Fleming and released in May of 2006. This plan estimated the cost of conversion to be at about $3.05 million over eight stages and ten years. 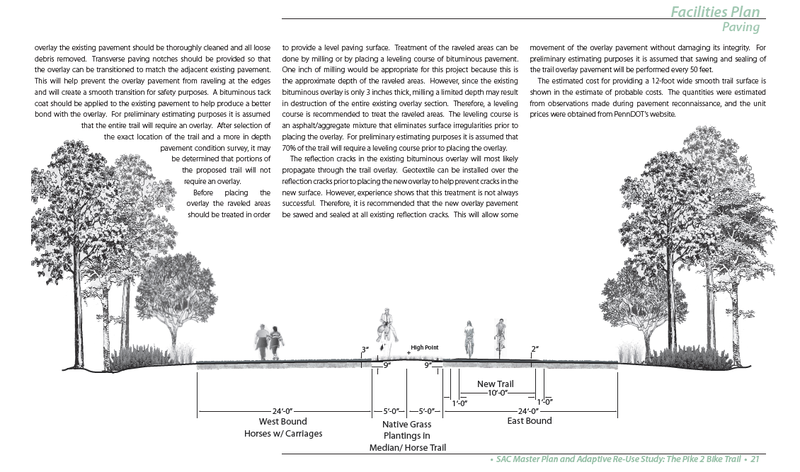 The old turnpike would see the westbound lanes converted to a path that would allow walking and horses w/carriages, the former 10 foot center median would become a natural trail for horseback riding, and the former eastbound lanes would become a paved 10' multi use trail with one foot shoulders on each side. The remaining width of the eastbound lanes would be reclaimed by nature. Two trailheads, western at US 30 in Breezewood, eastern at the former Cove Valley Travel Plaza, would be constructed. The tunnels would be stabilized and lit, bathroom facilities, and interpretive signage added. "Safety First" - This plan would stabilize the tunnels, provide access and basic amenities at two trail heads handling approximately 25,000 annual visitors. The cost was estimated at $3.28 million. "Family Friendly" - Along with the tunnel stabilization and safety improvements. This would resurface the turnpike for a multi-use trail. It would also include digging wells for water along the route, restrooms, signage, a "Midway Rest Area", benches, landscaping, and a solar charing area. The cost of this would be $4.29 million. 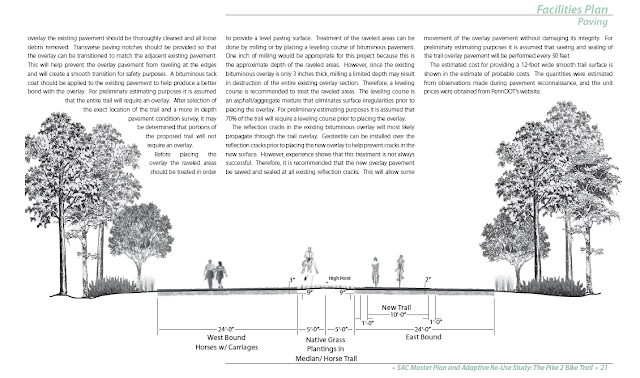 "Complete Connection" - This would include all items above and would connect the trail to other bike and hiking trails in the area along with the construction of a nature preserve within Fulton County. Also a historical museum would be built at the Fulton County trailhead. This plan would also allow for specialty vehicle access via an additional trailhead. Cost - $6.27 million. This plan estimates 225,000 visitors per year. All three of these plans would see Fulton County do the majority of the investing and an aggressive time schedule. The hope would be to have it completed over two years. (3) Fulton County has continued to be skeptical of the overall economic impact in regards to any investment that they make to the project. The concern remains that Breezewood with the tourism amenity infrastructure in place will see the most of the economic impact of such a trail. (1) Since the 2014 study and public hearings on the Fourth Economy study, there has not been any new news on the project. In the meantime, the abandoned turnpike is still being accessed by thousands annually. A private company called Grouseland Tours offers guided tours and bike rentals for the Pike 2 Bike. But sadly due to the lack of an agreed upon plan, leadership or fund raising, the abandoned turnpike continues to fall into further overgrowth and disrepair. Unfortunately, with each passing year the cost and effort needed to make the abandoned turnpike match the original 2001 vision of the Southern Alleghenies Conservancy increases and the chances of something being done smaller. (1) Maxwell, John B. "An Eastern Trailhead with Destination Services - Justification; Funding; Construction; Operation." May 15, 2014. (2) Rotz-Mountz, Chanin. "Pike2Bike Rehab Proposal Heard In Harrisburg Monday." The Fulton County News. September 25, 2014. (3) Rotz-Mountz, Chanin. "Pike 2 Bike Study Findings Released." The Fulton County News. February 20, 2014. Pike2Bike - Southern Alleghenies Conservancy Trail Network Master Plan and Adaptive Re-Use Study ---Gannett Fleming. There is so much good writing about the turnpike, yours included, that I decided to start writing about its online history. It's been an interesting project. Thanks for the kind words. Unfortunately, I live in North Carolina and am not able to attend the Bedford County meetings. I am Donald Schwartz, Director of the Bedford County Planning Commission. Much is occurring to bring this world class project to completion. Early in 2016 an 11-member committee was formed to oversee the update of the 2006 Master Plan. In October 2016 the Secretaries of the Dept. of Transportation and Dept. of Conservation and Natural Resources visited the P2B in an event that was attended by the print and TV media. Early in 2017 the firm of Navarro & Wright was retained to update the Master Plan. The update will be completed by the end of 2017, with the aim of moving to construction. The website pike2bike.com is now the official website for the project. It is still likely that a joint municipal authority between Bedford and Fulton Counties will be the final owner of the P2B property. On July 12 representatives of the Governor's office will be riding the trail. Finally, on October 29, 2017 a marathon and half-marathon will be held on the property (Trivium Racing; "The Race to Nowhere"). I am firmly committed to completing this project after six years of work and it will be done. What an amazing place! You can reach me at dschwartz@bedfordcountypa.org.